What is Pencom Injection (Benzathine Penicillin) used for? Pencom Injection (Benzathine Penicillin) is prescribed as a long term treatment and prevention of a wide variety of bacterial infections. It is typically used for severe infections including those affecting the respiratory tract, ear canal, bladder, or urinary tract. The medication operates by destroying or preventing the reproduction of bacteria cells allowing the immune system to eliminate the infection. Note that this medication is only useful for treating bacterial infections and will not have any effect against those caused by a virus or fungus. How should I use Pencom Injection (Benzathine Penicillin)? 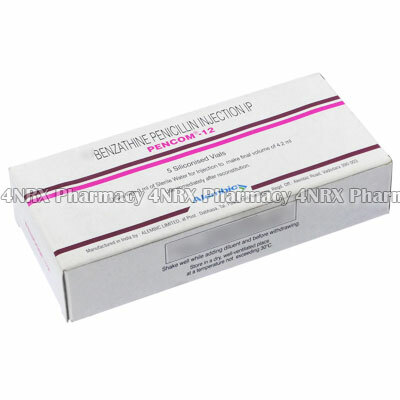 Pencom Injection (Benzathine Penicillin) should be injected by your doctor or another health care professional in a hospital or medical clinic. If you are required to perform your own injection, make sure you are fully instructed in the correct procedure to prevent any problems from occurring. The correct dosage will be determined by your doctor based on your age, weight, current health, the condition being treated, and the severity of your symptoms. To administer the medicine sanitize the needle and injection site, collect the prescribed amount of solution in the syringe, remove the air by holding it upright and pressing the plunger down until a small amount of medicine is released, and slowly inject the medicine into a muscle or vein. Always observe the medication prior to use to make sure it is not cloudy or discoloured. Attend any follow up appointments with your doctor to ensure the complete cycle of medication is finished. What are the side effects of Pencom Injection (Benzathine Penicillin)? Stop using the medication and contact your doctor immediately if you experience any serious side effects such as faintness, fever, flu symptoms, severe diarrhoea that is bloody or watery, or signs of an allergic reaction including hives swelling, or difficulty breathing. These conditions may require lower doses, reduced application frequency, or emergency medical attention in serious cases to prevent further health problems from occurring. Consult your doctor prior to using Pencom Injection (Benzathine Penicillin) to make sure you do not have any chronic health conditions that may cause unexpected problems during treatment requiring alterations to your treatment. Strictly use Pencom Injection (Benzathine Penicillin) as prescribed and follow all instructions provided by your doctor. Safe, suitable, and optimum dosage can vary and is dependent on the patient`s health and medical history, as well as the condition you are treating. Pencom Injection (Benzathine Penicillin) may not be safe or suitable for all patients. Always ensure your doctor is informed if you are pregnant or breastfeeding, using any other type of medication (including non-prescription medicine, vitamins, and supplements), as well as if you have any allergies, other illnesses, or pre-existing medication conditions.